Paul Granjon / Z Productions. Recently in residence at Campbelltown Arts Centre with Paul Gazzola in ‘Teaching a New Dog Old Tricks’, Paul Granjon’s work challenges pervasive human robot interaction memes in an amusing fashion. The RobotCultures Symposium at University of Sydney showcased some works such as ‘The Sexed Robots’. Paul Granjon’s homemade constructions and robots reflect his interest in what he calls the ‘co-evolution of humans and machines’. Granjon (b. France, lives and and works in the UK) regularly presents installations, videos and performances internationally and in 2005 he represented Wales in the Venice Biennale. In December 2007 Paul Granjon completed a 3-year NESTA Fellowship with the publication of a book / DVD that presents a comprehensive selection of work developed since 1996. 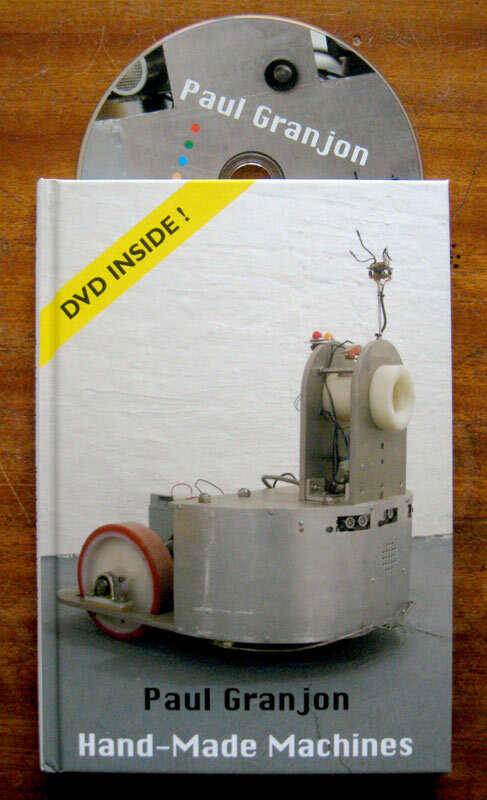 The book includes many preparatory drawings and colour photographs providing a comprehensive insight in the development of machines such as The Cybernetic Parrot Sausage, Furman the kicking robot, The Robotic Tail and Ears and The Sexed Robots among others. The publication is framed by two short essays by Anthony Howell and Paul Granjon. The accompanying DVD contains one hour of video including several short films, documentation footage of installations and performances as well as rare archive material. Includes a DVD video, all regions, PAL.